I'm hitting the road tomorrow! I've been looking forward to what's become our annual vacation to Sunriver, Oregon. We always have so much fun as a family (my grandparents, my parents, my sister, and me), and I also appreciate the quiet time. =) Sunriver is a beautiful place, and I can't wait to ride my bike, see the sights, read, etc. I'm so glad for times of rest! However, I've decided not to do any blogging while I'm gone. I think it will be good to take a break--and that way I won't be distracted from spending quality time with God and my family! I'll miss you all, though! You are such dear friends to me, and I've really enjoyed having my own blog! Your comments touch my heart, and I'm so thankful that you take the time to follow my blog. You are all so wonderful! First, the poll results are in! There were 14 people who voted, and (of the places I listed) the place you all most want to visit is . . . Ireland! Ireland received 5 votes. Coming in at a close second was Italy (with 4 votes). Third went to England (2 votes); and Hawaii, Germany, and Israel tied for fourth with 1 vote each. Europe seems to be the favored continent for travel destinations! Second, it looks like the Washington D.C. trip isn't working out. :( It's not for sure that it won't happen, but I think it would be best to accept the inevitable in this case. However, as a college student, I won't mind having more time at home! And since I won't have "Washington D.C. Week," I'm happy to do another themed week in its place. That being said, I would (again!) love your input on which theme you would prefer. The poll is in the sidebar. Thanks! Third, after having the big "Birthday Story Bash" week here on my blog with a Toy Story theme, I would love to share some pictures from my Toy Story themed family party! I apologize that I'm so late in sharing them! Here's my reaction when I first walked into the dining room and saw the decorations. (If you can't see my face because I'm too far away, I'm smiling broadly.) =) The party was at my grandparents' house. Aren't the decorations adorable? =) My mom used a lot of our old Toy Story toys to decorate the table. Don't you just love the barrel of monkeys and flying Buzz Lightyear hanging from the lights? Too cute! And of course I had to share a picture of me getting a book, right? =) That's my happy, "I just got the latest Francine Rivers book!" face. I'm still saving this one (Her Mother's Hope), but I'm looking forward to reading it! Here's the description of the book from Summerside Press' website: "In 1890, Lahaina is in the midst of unrest. Kaiulani, Crown Princess of the Kingdom of Hawaii, has recently become known throughout the world for her intelligence, beauty, and determination to restore her nation’s monarchy. When a Scottish missionary lands on the shores of Lahaina, he finds himself drawn into a revolt by those desirous of annexing the islands to the United States. Will he underestimate Kaiulani, the 'barbarian princess,' or can they work together to restore peace to this normally tranquil paradise?" Note: For some reason, the descriptions I found of the book online are not the same as the description on the back cover of the book. The description above is kind of misleading and does not do the story justice. However, I don't really want to retype the whole synopsis from the back cover! =) But hopefully you can get your hands on a copy and read it for yourself! This is such a powerful, moving book, that I'm sure my words here will not be able to express how much I loved it! The story is an amazing work of historical fiction, beautifully weaving together fact and imagination. And I was absolutely drawn in by the imagery! The author's writing style is delightful. Both of the plot lines--the past (late 1800s) and the present (1973)--intrigued me and kept me reading to find out more. I feel like I have done a lot of traveling through this book, from Hawaii to England. And each place was described in such a way as to take me there, right where the characters were. But it wasn't just the imagery that I loved--I also fell in love with the characters. I laughed at the antics of the young Princess Kaiulani and her friends, and I was moved to tears by the heartache she felt as an adult. My heart was also breaking for Sandi, the main character of the novel in 1973, whose husband was missing in action during the war in Viet Nam. And at the end of it all, I was amazed by how both stories were resolved, and how magnificently interwoven both plot lines were. Through Kaiulani's faith in God and the love between her and her dear friend, Hannah, I was truly blessed. And the love stories (both of them) left me more than satisfied. What a wonderful book! I have a lot to share with you today! =) So find a comfortable spot (like the one pictured above, which was also taken at the home we rented in Sunriver, Oregon last summer) and enjoy the scenery! Yes, I have a new blog design! Thank you to Ashley over at After All....... Tomorrow is Another Day for helping inspire me to really revamp my blog for each new season! Since yesterday was the first official day of summer, it made sense to make the switch now. I'm hoping that the new background, the picture above, and the color scheme all convey a sense of "summer." I would love to hear your thoughts on the new look for my blog! And I thought I would share my thoughts on it, as well, particularly the picture above. =) In the "Seasons of Humility," summer would be the time when we are humble before God and seeking His will--not our own. We are sinners (and therefore not perfect), so this season in our lives won't be perfect either. But, as much as possible, it will be a time when we let go and truly trust God and His plan for our lives. It's hard to come to the place where we surrender all that we have to Him. But, as paradoxical as this may sound, that is when we reach the mountaintop--for we are seeking to see our lives from God's higher perspective. The more humble we are, the more we are able to see God's powerful working in our lives and the more open we are to following Him. I hope that the picture of the mountain above (along with the tranquil and green, "growing" colors on this blog) will encourage you. May we, through the Lord's grace and strength, be coming ever closer to the summertime of humility! And soon . . . London! That's some list! And I thought I was quite the traveler! ;) So please join me in welcoming world-traveler Hannah! Amber: What is your favorite vacation destination? Amber: If you could travel to anywhere in the world you have not been, where would you go and why? Hannah: I have been many places, but I really would love to go to Italy. My dad's side of the family is very Italian; his grandparents came over from Italy. So, I have some ties. I mean, my last name is Cerasoli! Lol! They have gondolas, lots of history, and good food. Why wouldn't I want to go? I'd love to track down some of my family history also. Amber: What setting would you choose if you were writing a book? Hannah: My story would probably take place in a small town. Then, depending on the story, it could be a small town mystery/murder or a small town romance story! It leaves my options open. Amber: What is one thing you love about your hometown? Hannah: I live in a relatively small town (especially compared to others), so I love how everyone knows everyone. I know that sounds cliche, but it's always fun when news gets around. *A bit of sarcasm* No, really though, it is fun to have nosy neighbors sometimes and little old church ladies that want to know all your business, because you know they care. It's not like the city where everything passes everyone by. You stop and take the time to listen and tell stories because you all care about each other. Amber: Thank you, Hannah, for sharing some of your experiences with us and for visiting "Seasons of Humility" today! Here's to many more wonderful travels! Are you enjoying your vacation time? I sure hope so! =) Yesterday, it was great hearing about all of the places you've been or would like to visit someday! Doesn't the scene above look inviting? This picture was taken at the home we rented for a short time in Sunriver, Oregon last summer. And if the tree outside looks familiar, that's because I think it's the same tree whose picture graces the top of my blog page (or at least one close by to that tree)! Today, I am thrilled to welcome Laura Frantz, author of The Frontiersman's Daughter and Courting Morrow Little. So sit back and enjoy some travel stories from Laura! Laura: Europe. I have a brother who lives in Spain. He has lemon trees in his yard - with real live lemons! Doesn't that sound nice? And I have a cousin in Russia. I've been to both places but would love to go again - to Spain for the weather and to Russia for the old palaces and Romanov history. Laura: I'd go somewhere warm - the Bahamas, I think, with all that white sand and amazingly blue water. I love the heat and miss the sun living here in the cloudy, often rainy Pacific Northwest. Though I appreciate my woodstove, I am a southern girl. But I must admit, all the gloom is very conducive to writing! Amber: How did you choose the setting for your books? Laura: I think my setting chose me as I was born and raised in Kentucky. Since my family came into the area in the 18th-century, I've been steeped in that history and it's a natural part of me and my stories. It's such a beautiful place and so historically rich. Laura: The inherent graciousness of the people there. You really never meet a stranger. And then there's the food and the music and the weather and... Can you tell I'm homesick?! Amber: Thank you so much for visiting with us today, Laura! Readers, you can find Laura at her blog, LauraFrantz.net. If you would like to take a look at our recent discussion of Laura's book The Frontiersman's Daughter, click HERE. And if you would like to share your responses to any of the questions I asked Laura, I would love to hear them! Bring a good book, pull up a chair, and relax. It's "Vacation Week" here on "Seasons of Humility!" Time for some relaxation and sharing travel stories. Are your bags all packed? I hope you brought plenty of sunscreen! I'll pour some glasses of ice-cold lemonade for all of you as we get started! And what better way to start then to share our favorite vacation destinations? I've done a bit of traveling in my life so far. =) Besides traveling within the United States, I've been to Canada and to Israel. Victoria, Canada is a gorgeous place! I have many fond memories of childhood vacations there. Riding the ferry to Victoria . . . seeing all the baskets of flowers hanging along the sidewalks . . . shopping in all the quaint stores . . . etc. And the Butchart Gardens are fantastic! You can check out the website HERE. The fireworks displays at night are astounding, and there are so many flowers! And as for Israel . . . what can I say? The country is breath-taking! The scenery is so different: from mountains and the Sea of Galilee in the north, to the Mediterranean Sea to the west, to desert to the east and south. It's a trip I don't think I can ever forget. The land is filled with history, and it's amazing to see places mentioned in the Bible! I went with a great group of people, and I'm so blessed to have had such a grand opportunity! Now, what about you? Where have you traveled to, and/or where are some of your favorite vacation destinations? Oh, and be sure to check out the new poll! That way you can also share where you would like to travel if you could! And one more thing: Happy Father's Day! What better way to celebrate than to talk about rest and relaxation? =) To my Daddy and Grandpa: I love you both so much! Hope your Father's Day is wonderful! After sitting through advertisement after advertisement, and then the cute movie "short" from Pixar, it was finally time. It was a thrilling moment for me--after the long wait, I was finally going to watch Toy Story 3! And oh! this movie did not disappoint in the slightest! If I had to describe it in three words, I would say that the movie is heart-warming, heart-pounding, and heart-breaking . Yes, all three of those words! Heart-warming: This came in many forms! Whether it was the family dynamics between Andy, his mom, and his sister (which were certainly true to life--arguments and all! ), or the romantic elements between Buzz and Jessie (this isn't giving anything away if you've seen Toy Story 2, because that was hinted at towards the end), I was touched by it all. There were many moments that were cute and funny! Heart-pounding: Yes, there was quite a bit of action in this movie--even more so than the other two, I think. And there were moments when I was really afraid for the characters. The villain is quite dastardly, and while he reminds me of Stinky Pete from the second movie (a bit), I thought he was even more evil. Lots of danger involved in this movie! Heart-breaking: Oh! This was the hardest and most moving part of the movie. There were numerous sad moments throughout the movie, and there were some that even brought me to tears. And this wasn't the occasional tear that trickled down my cheek like when I watched other Pixar movies--this was practically sobbing in the theater because I just could not hold in the emotion. It's practically impossible (at least it was for me!) not to cry! If you've seen the previews, you know that Andy is getting ready to go to college. And this really, really hit home for me and my friend. Pixar captured the feelings so well. Overall, this movie has it all! If you loved the first two Toy Story movies, this one is a must-see! But if you're anything like me, be sure and bring some tissues. It's harder to watch than many other Pixar movies, but it's more than worth it, especially with its great message about putting others before oneself. I highly, highly recommend it! Also, be sure to come back next week for "Vacation Week" here on my blog! I will be posting an interview with Laura on Monday, June 21. So fun! Before we get started, I must say that if you haven't read the book, there will most likely be spoilers given throughout the course of this discussion. If you're the kind of person who doesn't mind spoilers, then we'd love to have you join us anyway! If they do bother you, however, then I hope that this post will at least encourage you to read the book sometime. =) I highly recommend it! "One woman searches for love--and herself--in a wild land. This epic novel gives you a glimpse into the simple yet daring lives of the pioneers who first crossed the Appalachians, all through the courageous eyes of a determined young woman who would not be defeated." Do you think that a relationship between Simon and Lael could have ever worked? Did Simon become who he was because he was denied a relationship with Lael, or would his true identity have revealed itself no matter who he ended up with? Lael truly has a heart for her homeland. If you were in Lael's position, would you want to stay and teach at Briar Hill (civilization) or would you decide to go back to Kentucke (the wilderness)? And off of that question, how much do you think where we were raised affects our behavior and choices later on in life? Do you feel close ties with your hometown? This question is definitely a spoiler, so beware to those who haven't read the book! ;) But I simply have to ask it: What do you think of Lael's choice of men? What are your feelings about Captain Jack? Ian Justus? Do you think Lael really loved Captain Jack? Or do you think that her feelings for him were something else, especially because he played such a big role in her past? I'm very curious to hear what you all have to say about this! I know this is only skimming the surface of this rich, deep novel. I read it last fall, and I might not remember as much as I should, in which case I apologize. But I hope these questions will at least get a good discussion going, and then feel free to take it wherever you want to! Any thoughts you want to share about this book are welcome! So . . . let's start discussing! Thank you all for being so patient! I finally finished the book, and I can now share my review with you! Here's the description of the book from Barbour Publishing: "Discover the Washington Monument along with park ranger Vickie Harris who loves her job. But while life in the District of Columbia is exciting and fun, shy Vickie has resigned herself to the likelihood of being single forever. She’s never been head-over-heels in love. . .not even really been kissed! But when a handsome professor asks the reserved, research-loving ranger for assistance on a project, will Vickie agree? Will she come out of her shell long enough to discover that Love Is Monumental?" If I don't get to go to Washington D.C. this summer, at least I'll feel like I have been there after reading this book! I really appreciated the fact that the author knew what she was writing about, and I enjoyed getting to read about the life of a park ranger. I also enjoyed the descriptions of the monuments, and even just every-day life in general. I found that I often sympathized with Vickie and her romantic heart! I agree with my friend Renee's review in that the twists in this novel were rather predictable, but I don't think that ruins the story because the merits of the book really are it's down-to-earth dialogues and emotions. A lot of what the character's go through, and a lot of what they say, can be easily related to, in my opinion. That being said, I confess that Thatcher didn't really win me over until the end. I was quite frustrated with him for most of the book, and sometimes I just wanted to hit him upside the head and let him know, "Yes, you're going about this relationship all wrong." But he had his "charming" moments, and perhaps that made it all more real to me, as I couldn't help but feel bad for Vickie and understand where she was coming from. All in all, the story fit together nicely. Perhaps a bit too nicely to be completely realistic, but it was still sweet just the same. And while at times the book felt a little long, I liked this story! The trip to Washington D.C. through the pages of this book was quite enjoyable! How many of us like to hear criticism? I think I am a rather introverted person, and this could lean towards self-centeredness. Hearing that I've been grouchy, impatient, and a semi-hermit lately is . . . well . . . hard. Perhaps I have been on the computer too much. Perhaps I have been so lost in my own thoughts that I've been rude. And perhaps I needed to hear from a loved one just how selfish I've been. I tell you all of this because I hope that maybe you can learn from my mistakes, and that we can learn together the importance of hearing the bitter truth and repenting--changing our ways. I also tell you this because I would appreciate your prayers. It's not just that I've been rude to my own family. There's also a fine line between being a shy person and being unsocial, and I'm afraid that when it comes to church and other functions, I tend toward the latter. "He that refuseth instruction despiseth his own soul: but he that heareth reproof getteth understanding. The fear of the Lord is the instruction of wisdom; and before honour is humility." Whichever "Season of Humility" you're in right now, may God help you see yourself in an honest light. And may He give you strength to change if necessary, and hope that a new season will come in His own time! 1. This song is a great reminder of where our source of strength comes from--Jesus! It is on Him we stand! 3. I love this band! I really loved seeing them in concert. There are more videos on YouTube of their music, and you can find the band at their website. Here's the description of the book from Barbour Publishing: "Welcome to the wilds of Montana, where humor, romance, and suspense ride the range. Glowing Sun, a white woman raised by the Flathead tribe, has vague memories of her former life, including a name—Abby Lind. When she’s forced to sever all links with her adopted family, Abby wonders if she’ll ever find a home again. Tenderhearted Wade Sawyer, responsible for Abby’s survival during the village massacre, convinces the knife-wielding woman to return with him to the Sawyer Ranch, never realizing danger lurks behind every corner. Can they survive long enough to fall in love?" This book certainly delivers on "humor, romance, and suspense," as Barbour Publishing's description suggests! Connealy's word choice, her descriptions of the characters, and the crazy situations they find themselves in are very clever, and many of the lines are laugh-out-loud worthy. I enjoyed reading this book! There were a couple of aspects of the book that bothered me a little, though. While there was certainly a realistic element to the story with Wade's father's temper and anger, I felt that Abby's reaction--the words she said to him and her attitude towards him--was disrespectful and uncalled for, especially because Mort was Wade's father, not Abby's. Also, I felt that the situation with the Native Americans was unresolved, and while that is understandable to some extent, I think it could have been addressed a bit more before the end of the story. However, I really enjoyed reading more about the characters from the previous two books in this series, and their parts of the story were just as intriguing--and very sweet and fun! Reading about the relationship between Cassie and Red made me wish I had read the first book. I think it must be a compelling read! As some of you know, I'm a big fan of Borders. They must really love me there! ;) But I think something has got to change. It seems that every time I go there, I lose self-control and I end up buying at least one book. Yes, in a way, it is funny. But it's a problem, too. So, here's my idea: For the rest of the summer, no more buying for myself! 1. Maybe by writing down exactly what I want to accomplish and why I want to accomplish it, I will have a better chance of sticking to the plan. 2. By sharing why this is on my mind, maybe you will be encouraged in your faith, as well. Necessities: I will allow myself to buy food (even occasional treats), personal care items, etc. when I need them. Giving: I will allow myself to buy gifts, postcards, etc. for others. Especially with so many birthdays coming up! Basically, I need to stop buying books, movies, music, etc. for myself. Any more books I get this summer will have to be ones I get for free to review or ones I win in giveaways. Now, here's the point of all of this! During my devotional time, I have been reminded of the importance of treasuring Christ above all else--above money, possessions, and even other relationships. The Radical Question by David Platt emphasizes the importance of giving our all to Jesus and being devoted followers of Him (at least from what I've read so far). It's important to remember that God comes first! Another devotional book I've been reading (I'm now on my second time through) is Life as a Vapor by John Piper. Talk about a wake-up call! Our lives are so short; therefore, remembering our priorities is key. The reason I got this devotional book was because I saw it at our bookstore this last semester, and I recognized the author as the one who wrote a book we read in our Global Perspectives class (the book was called Don't Waste Your Life). I've noticed that in his books he often refers to our need to treasure Jesus, and by doing so, show others their need to treasure Him, as well. And Piper says that treasuring Him brings Him glory and us joy! How amazing is it that God gives us fulfillment and joy by worshiping Him? Thank you for taking the time to "listen!" May this summer be filled with time focused on God and sharing His love with others! May we treasure Him above all! I hope this has been as fun a week for you as it has been for me! =) I have a lot to share with you, and hopefully it will all put a smile on your face. It's been a while since we've had a "Sharing a Smile" Saturday, so it's about time, I say! Book Discussions: I think our discussion of A Passion Most Pure turned out really well! Thank you to all of you who shared your thoughts! And thank you, Julie, for joining in on the discussion of your book! With such a positive response, I was thinking of doing one more book discussion this next week, before things get a little hectic on this blog. So if you don't mind voting one more time on the book you would like to discuss, the poll is in the sidebar waiting for you. =) Thanks! June 20-24: Vacation Week--Travel with me to some exotic and relaxing locations! Special features of this week include author interview(s) (number of interviews pending). July 9: "Hot Summer Day" with Julie Lessman--Stop by to enjoy a summer-themed interview with author Julie Lessman! This will be your chance to win a copy of one of Julie Lessman's books, including her upcoming release A Hope Undaunted! July 19-24: Christmas in July!--Break out the mittens and scarves, grab a cup of hot cocoa, and join me for a week of winter fun in the middle of summer! And there should hopefully be even more summer fun after all this! These events might whet your appetite for more. =) However, I also have a couple of other vacations planned this summer that might take me away from the Internet. Just a heads up! Blogging Buddies: I just have to tell you that I've realized recently how much I talk about blogging to my family and friends. I'm loving having a blog and reading others' blogs! =) And it's your friendship, your kindness and encouragment, dear readers, that really makes blogging so wonderful! You're very real friends to me, and I'm so very thankful for all of you! P.S. Isn't it funny that if you post at anytime before midnight on Saturday, the post will still be labeled "Friday"? It looks kind of interesting to have the heading be "Friday, June 11," while I say "Happy Saturday!" ;) But it is indeed Saturday as I write this now! 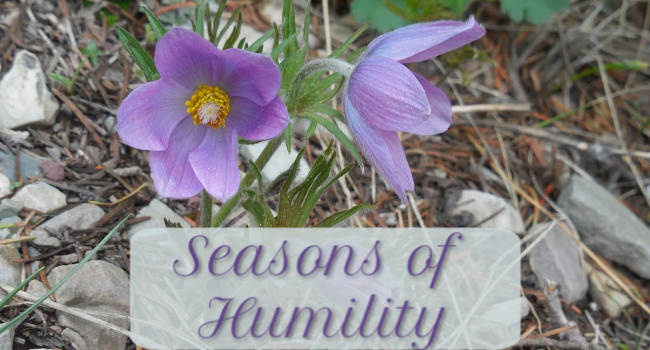 Welcome to the first ever book discussion on "Seasons of Humility!" Before we get started, I wanted to share the poll results with you. It's nice to know that the people who read my blog share similar interests with me. Of course, the fact that you read my blog might be because we have similar interests! Funny how that works. 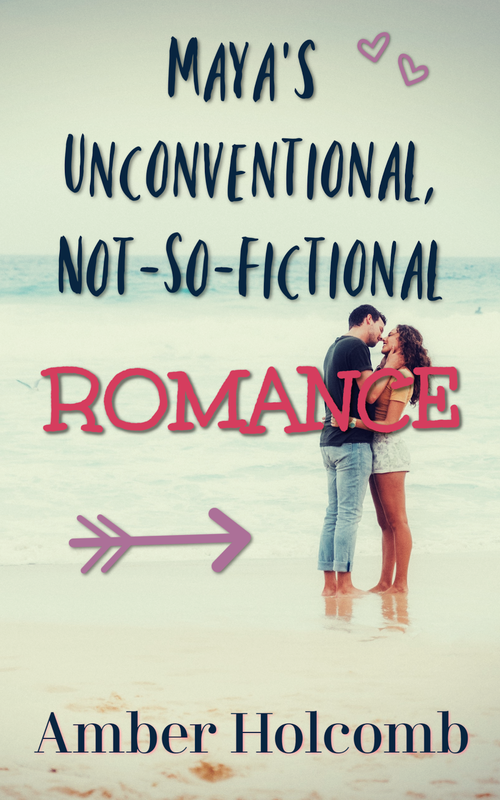 =) Well, I read a lot of Christian Romance and Christian Historical Romance, so you can get your fix of your favorite fiction here! As to the other poll, there was an overwhelming majority in favor of discussing Julie Lessman's A Passion Most Pure. (And this book just happens to fit into the Historical Romance category!) I am happy to oblige! Julie's debut book is simply fabulous! It's been about a year since I've read the book, though, so I hope I can still lead a good book discussion! That being said, for any who haven't yet read the book, it is possible (actually, quite likely) that there will be some spoilers given away throughout the course of this discussion. If you're the kind of person who doesn't mind and you would still like to be a part of the discussion, feel free to join in! If not, however, than maybe just reading this far in the post will inspire you to pick up Julie's book. =) I highly recommend it! And one more order of business: I have a wonderful surprise for all of you! Be sure to stop by on Friday, July 9, because I'm going to be featuring Julie Lessman here--on this blog! And yes, there will be a giveaway! It's going to spectacular, so be sure to mark your calendars! "She's found the love of her life. As World War I rages across the Atlantic in 1916, a smaller war is brewing in Boston. Faith O'Connor finds herself drawn to an Irish rogue who is anything but right for her. Collin McGuire is brash, cocky, and from the wrong side of the tracks, not to mention forbidden by her father. And then there's the small matter that he is secretly courting her younger sister. But when Collin's affections shift, it threatens to tear her proper Boston family apart. Book 1 of the Daughters of Boston series, A Passion Most Pure will carry your heart from the sophisticated streets of Boston to the green hills of Ireland as men go off to war and women long for their return. Full of passion, romance, rivalry, and betrayal, it will captivate you from the first page." The verse at the beginning of the book is Ecclesiastes 2:26, which says, "To the man who pleases him, God gives wisdom, knowledge and happiness, but to the sinner he gives the task of gathering and storing up wealth to hand it over to the one who pleases God. This too is meaningless, a chasing after the wind" (NIV). Why do think Julie Lessman chose this verse to start out the book, and how do you think it fits with the story? I found it to be an intriguing twist that instead of having the story focus on three sisters--Faith, Hope, and Charity--only Faith and Charity have a "real" part. In fact, Hope was Faith's twin sister, but she died before the story even begins. What do you think the author was trying to say through this symbolism? What is the effect of having already lost "hope" before the start of the book? On page 303, Faith says, "Mitch, please understand, my faith means the world to me. I have every intention of saving my . . . well, my affections . . . for the man I marry. I want to see you, I do. But I can't indulge in 'favors,' as you put it, because they're wrong. That means if you and I are going to have a relationship, I need you to know I mean what I say. We can occasionally kiss, Mitch, but when I say no, the kissing is over. And if it isn't, the relationship is." What do you think of Faith's stand? Do you think she is demanding too much, or too little? Should she let a man she is not married to kiss her at all? Whew! I could go on and on, I'm sure. =) I've given you some food for thought, and I'd love to hear your feedback! Don't feel like you have to address all these questions! Address just one, or all if you desire. I'll check in later! To Tell a Story . . . Stories are grand, aren't they? What better way to communicate with others than by telling a story that they can relate to? We remember lessons we learn from stories, whereas much of what we try to learn through textbooks, lectures, etc. generally is forgotten as the years go by. Let me read, hear, or see a good story, and all of a sudden my mind and my emotions are engaged. Stories can be so powerful! For example, I watched The Last Sin Eater again recently, and once again I was moved to tears. It's a sad, heart-wrenching story, but it's because of how terrible the characters' pain is that the hope of redemption truly stands out in the end. God's grace alone can save, and ignoring the truth of sins that have been committed will only lead to despair. The connection made by the Man of God between the need for our sins to be eaten and Jesus being the only true "Sin Eater" is so, so powerful. I highly recommend both the movie and the book! Below is a video I found on YouTube of a preview for the movie. But stories are not only told in the written word or on the screen--I was blessed to hear a dramatic monologue of the book of Luke in the Bible this last spring at school. (This last semester in chapel, too, was all about stories!) How wonderful to have a different perspective, to really hear and see the gospel story! When we read about characters that seem so real . . . when we see a performance or a movie with real people . . . we are drawn in and we are a part of the story. I'm so glad that God has given us the ability to communicate with each other in so many different ways, especially through stories! Even songs can tell stories! It's raw emotion that grips us and won't let us go. And for those of us who love to write (whether we are published yet or hope to be published someday), we want to create stories that are about real people--people who mess up, people who get hurt, people who laugh, and people who question. And by putting characters through hard situations--by showing despair, heartache, and pain--hope and truth can shine all the brighter, and the readers can be encouraged as they continue living their own story. May God use us, whether we are writers, directors, musicians, or simply talkers with true stories to share with others, to bring Him glory and remind each other of His truth, His love, and His grace. His word abounds with true stories and true messages, as well. May we spend more time drawing closer to Him by reading the Bible, as the Bible tells of His interactions with the people He loves. He cares about us and has offered us a way back home through Jesus. May the truth of that encourage us all throughout the stories of our day, and our whole lives! Lilly Westbrook is a dime novelist—but it’s a secret she’ll keep as long as possible to protect her family’s reputation and maintain her secluded lifestyle. Conflict abounds for Lilly as she must choose between two men and fend off those who would expose her secret to society. The tension of Lilly’s secret, along with the decision she must make between the two potential suitors, are what keep the story going and are what kept me interested in the outcome. I confess that after having recently read another book set during the Gilded Age that I found very realistic, this book seemed to be a bit less true to life. Also, while I was curious how it would all work out, I do feel that the tension might not have been strong enough in some ways, as I found that the conflicts were stretched to the limit and grated a bit on my patience with the characters. All in all, though, I thought this story was very creative, and I enjoyed the ocean imagery and the little twists and turns throughout the book. Love on a Dime is a fun, interesting read! I just wanted to ask for your input on which book you would prefer to discuss this week. I would greatly appreciate your vote on the poll in the sidebar. The discussion will begin on Friday, June 11. Thank you! What are you reading right now, and what are your thoughts on the book so far? Books, Books, Books! And Blog Award # 4! I have lots of great reading material for the weeks ahead, so I hope I'll have lots of great reviews in store for all of you! And since I just acquired some new books, I thought I would share my excitement for reading by doing a mini theme of "books" for this week. And as far as themes go, let's just say that I'm thinking about having another themed week soon that will take us on a "blogging vacation." Hopefully I'll have more information to share with you in the coming weeks! Now for the blog award! 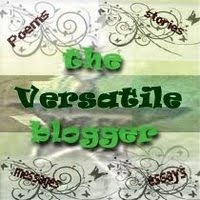 Laura Frantz over at LauraFrantz.net passed on "The Versatile Blogger" award to me! Thank you so much, Laura! If you haven't already visited Laura's blog, please do! She is the fabulous author of The Frontiersman's Daughter and her new book, Courting Morrow Little. I haven't read Courting Morrow Little (yet! ), but The Frontiersman's Daughter is a wonderful read! Beautifully written! These three wonderful bloggers post about a variety of things, from book reviews and giveaways to what's going on in their lives. These bloggers have great posts and great comments, and they really connect with their readers. Thank you for your great blogs! Here's to the start of a a fresh, new week for all of us! And now for the moment you have all been waiting for. It's time to announce the winners! Winners have through Monday to respond to my e-mail, or I'll pick another winner (so be on the lookout for that e-mail!). And the winners are (drumroll please) . . .
And now for some huge "thank you"s! Hannah over at Project Journal gave me a grand surprise party on her blog yesterday!!! It was wonderful! In fact, I think there might still be some cake left over, and that bouncing house might still be up if you want to go check it out. ;) We would love to have you join the party! Cerella Sechrist: Thank you so, so much for letting me interview you, and for giving away a personalized, autographed copy of your book! It was so much fun having you visit this week (and in the past, as well!). Thank you for your kindness! And a BIG, BIG THANK YOU to all of you!!! Your sweet comments and your enthusiasm made this week a memorable one for me. I hope you all had even half as much fun as I did! Thank you for making my birthday week so special for me! In closing, I want to remind you that Toy Story 3 is coming to theaters June 18! Don't forget!!! And here's a video I found on YouTube of "You've Got a Friend in Me." I think it's a great song to sum up how I feel. You, my dear blogging friends, have a friend in me! Happy Friday to one and all! Today is the last giveaway day of the birthday bash. Tomorrow all the winners will be announced! Once again, I will remind you that each day of the bash will include a guest interview; movie, book, and song-of-the-day selections; and a giveaway! Also, each day will have its own theme based off of one or more of the characters from Toy Story. Today's character is . . . Slinky Dog! Thus, today's theme is all about animals (especially dogs)! Now my 12-year-old sister is a big fan of animals, and even though that's not what she's going to talk to us about today, I think it makes her just the right candidate for an interview today! She was very sweet about agreeing to be interviewed for my blog, and with some prompting I got her to answer the questions for me! =) So please welcome my sister, Emily! Amber: Who is your favorite Toy Story character? Emily: Woody is my favorite character because he has a lot of enthusiasm and he's a good friend. Emily: I really like The Hardy Boys series because it's adventurous and has a lot of action in it! I also like The Hardy Boys T.V. series from the 70s. My favorite character is Joe Hardy! Amber: If you could be a Toy Story character, who would you be and why? Emily: I would probably want to be Jessie, because she's friendly and active. She's a lot of fun! Readers, I also have a fun story for you about Emily! When she was about 3-years-old, we went to Disneyland. She had a Woody doll that she carried around with her everywhere. One time Princess Belle came and asked if we would like to walk with her for a little bit. It was winter time, so Belle had a muff with her, which she let my sister carry. Well, Emily put her Woody doll in the muff, and we had a wonderful time walking with Belle to Snow White's wishing well, where we got some great pictures. So, so cute! Just had to share (and now you know that Emily's love of Woody is not a new thing!). And now for the final giveaway! (Or should I say giveaways, plural?) Angie from Never a Dull Moment not only offered to giveaway the book for Tuesday (The Prophecy), but she also offered to give away the books for today! She picked them out to fit especiallly with the Slinky Dog/Toy Story theme! Thanks so much, Angie! 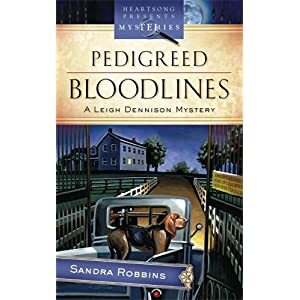 The first book is Pedigreed Bloodlines by Sandra Robbins. Here's the description from Amazon.com: "When Leigh Dennison’s dear friend and champion show-dog breeder, Addie Jordan, is killed, Leigh goes on the hunt to sniff out the murderer. If only she could devote full time to her sleuthing. But Leigh, who has never been a dog lover, now finds herself as the owner of Addie’s kennel, which houses a puppy with a bright future in the show ring. Attention Deficit Disorder is just one obstacle Leigh must overcome as she sets out to succeed with the kennel and find the person who killed the woman she loved like a mother. At the top of her suspect list: a homeless Vietnam veteran, a young Cherokee high school dropout, the owner of a rival kennel…and the man with whom Leigh is falling in love. As clues unfold to the killer’s identity, she makes another surprising discover—there’s a reason a dog is known as man’s best friend." 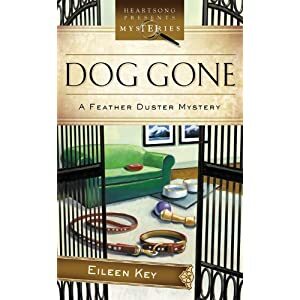 The second book is Dog Gone by Eileen Key. Here's a description of the book from ChristianBookstore.net: "Cleaning lady Belle Blevins dusts off her sleuthing skills. . .
when a rash of missing dogs jeopardizes her best friend s boarding business. Why would anyone go to such extremes to steal a family pet? When Belle learns the missing animals could possibly be in the hands of dognappers, she trades her vacuum for a detective kit and enters the world of valuable show dogs. Will she win a blue ribbon in the romance category? Or will her curiosity put her on the no-show list for the next round of competition?" Both of these books are Heartsong Presents Mysteries books. It's a double giveaway! Whoever wins today's giveaway wins both books! To enter, just leave a comment saying you would like to be entered. You must have a U.S. mailing address, and you must leave your e-mail address in your comment. Have a "d0g-gone" good day! Today is the day! I am now beginning my last year as a teenager, and I'm so thrilled I can celebrate my 19th birthday with all of you! Just as a reminder, each day of this birthday bash includes a guest interview; movie, book, and song-of-the-day selections; and a giveaway! The main theme for the week is Toy Story, but each day will also have its own theme based off of one or more Toy Story characters. Today's characters are . . . the members of the Roundup Gang! Thus, today's theme is the Wild West! The Roundup Gang consists of Woody, Jessie, Bullseye, and Stinky Pete. Toy Story 2 shows the viewers Woody's famous past. He used to be the star of a T.V. show! How cool is that? Now, there have been quite a few western-themed T.V. shows in the past, but I confess the only one I've really watched much of is Bonanza--and I am a big fan! I absolutely love the show, and I actually just watched an episode last night with my family. I love the theme song! I love the actors! And I LOVE the setting! Virginia City, Nevada is a great place to visit, and I actually wrote a paper in high school (an extended essay for my IB Diploma) on the social aspects of the town during its heyday. It was quite the place, let me tell you! There's lots of history there, and the town feels so alive with the past. As you can probably tell, it's one of my favorite places! Question: Who is your favorite Toy Story character? Also, I talked with my mom about this, and I think we both agree that it's so fun to see Tom Hanks shine through Woody's character! My parents and I are big fans of You've Got Mail, Sleepless in Seattle, and Joe vs. The Volcano. Many of the Tom Hanks movies that I've seen (not all) have been very sweet/fun, and I enjoy hearing his voice for Woody's character! My Answer: This really is a hard question! (Sorry to all of the people I've interviewed or will interview!) I absolutely love stories! I love the book and movie versions of The Last Sin Eater (book written by Francine Rivers; movie directed by Michael Landon Jr.). There is a lot to take away from that story! I love the first and second Anne of Green Gables movies. I enjoy certain Hallmark-type movies very much. As for family stories, the story about my great-great-grandfather's life (on my mother's side) is fascinating! Although I have a horrible confession to make: my grandpa has written a book on my great-great-grandfather's life, and I have never completely read the book all the way through. :( I need to remedy that! Anyway, my great-great-grandfather spent much of his life on the sea. And my grandpa, for my 16th birthday (I believe), gave me a ring that belonged to my great-great-grandmother, which was given to her by my great-great-grandfather when they were both out at sea together. I was so touched! I could go on and on, but I'll stop now! Question: If you could be a character in Toy Story, which character would you be? My Answer: I think I would either want to be Jessie or Bo Peep (to echo Renee!). It would be fun to be a cowgirl, and to be part of the Roundup Gang! It would also be fun to dress up and take care of cute sheep! I also saw that there is going to be a "bookworm" character in Toy Story 3, so I could definitely associate with that character! Now for the selections of the day! Here's a video I found on YouTube of another song by The Sons of the San Joaquin. You should be able to find Great American Cowboy on YouTube, as well, but I loved the video of this song, and I think it really fits today's theme! Today I'm giving away my gently-used copy of Love Finds You in Pendleton, Oregon by Melody Carlson! Here's the description of the book from Amazon.com:"Native American beauty Sunny Westcott is not one to let her hair down. But her friend Aubrey manages to drag her to Pendleton, Oregon, and the pair arrives just as the hundredth annual Pendleton Round-Up begins. Sunny is surprised by how much she enjoys watching the rodeo, riding horseback, and getting to know Aubrey’s family—particularly a handsome cowboy named Cody. Pendleton is also home to the Umatilla reservation where Sunny’s ancestors once lived, and the trip gives her the chance to do some digging into her family’s history—a topic she knows next to nothing about. But will Sunny like what she finds? And how will skeletons from the past compete with the current drama unfolding in Cody’s own family?" To enter the drawing, just leave a comment letting me know you would like to be entered. You must have a U.S. mailing address, and you must leave your e-mail address in your comment. Have a great day full of adventure, and at the end of the day may you ride off into the sunset! Yee-haw!